Trump releases video apology after haters leak lewd video of him from 2005. For the first time since his campaign began, Republican candidate Donald Trump apologized to the public after a recording of him making lewd comments which objectified women was released. The video is from 2005. In his apology, Trump mentioned that former president Bill Clinton had made worse remarks towards women. 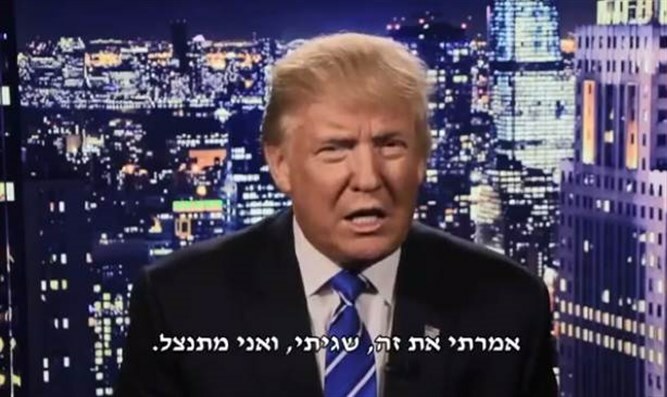 The Council for Republicans Overseas Israel has said "Trump is an outspoken person...[the] issue has been overblown by critics." Democratic candidate Hillary Clinton used the moment to attack Trump on Twitter. She wrote, "This is horrific. We cannot allow this man to become president." The investigation into Hillary Clinton's role in the Benghazi scandal has not yet been completed. In addition, though Hillary Clinton did not take proper precautions to secure classified government emails, the FBI recently decided not to indict her. Many Jews support Trump because they fear Clinton.